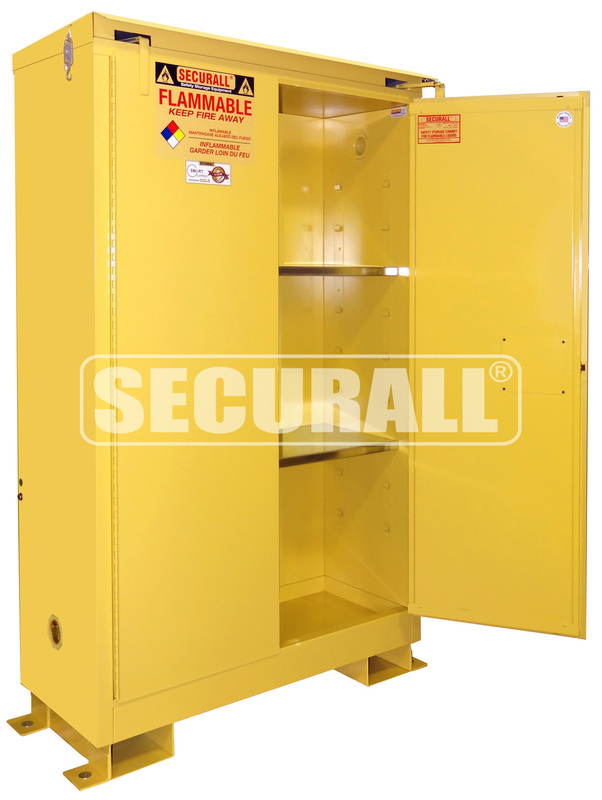 Double-Wall Weatherproof cabinets are all-welded, 18-gauge galvannealed steel construction and painted with a weather-resistant, impact-resistant urethane finish that is also resistant to ultra-violet rays. All Cabinets Standard Features include a sloped roof with a 2 3/4" overhang along with interior and exterior astragals to prevent rain penetration. Weatherproof cabinets come standard with corrosion resistant flush-mounted stainless steel locking handle, but may be upgraded to Stainless High Security Hasp Lock. 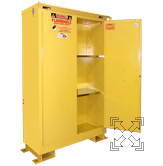 Easily move these cabinets to the appropriate work location using built-in heavy gauge fork lift channels and secure them with fully-welded 7-gauge steel Bolt-Down Brackets with 7/8” diameter mounting holes. Available on all standard cabinet models with manual and self-closing door styles. Self-closing Safe-T-Doors have fusible links that melt at 165°F allowing the doors to automatically close and latch. 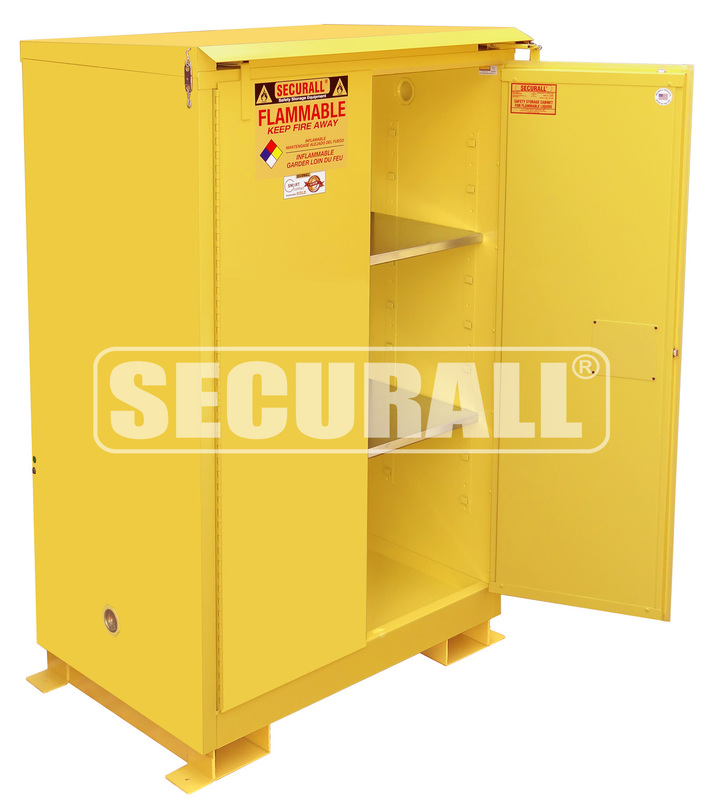 Cabinets meet: EPA 40 CFR 264, 265, NFPA Code 30 & OSHA 1910 requirements. A130WP1 - Self-Latch Standard 2-Door; Shelves 1; Dimension 48"H x 43"W x 18"D; Approx. Ship. Wt. 282 Lbs. A330WP1 - Self-Close, Self-Latch Safe-T-Doors; Shelves 1; Dimension 50"H x 43"W x 18"D; Approx. Ship. A145WP1 - Self-Latch Standard 2-Door; Shelves 2; Dimension 69"H x 43"W x 18"D; Approx. Ship. Wt. 372 Lbs. A345WP1 - Self-Close, Self-Latch Safe-T-Doors; Shelves 2; Dimension 71"H x 43"W x 18"D; Approx. Ship. Wt. 392 Lbs. A160WP1 - Self-Latch Standard 2-Door; Shelves 2; Dimension 69"H x 31"W x 31"D; Approx. Ship. Wt. 423 Lbs. 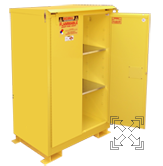 A360WP1 - Self-Close, Self-Latch Safe-T-Doors; Shelves 2; Dimension 71"H x 31"W x 31"D; Approx. Ship. Wt. 445 Lbs. A190WP1 - Self-Latch Standard 2-Door; Shelves 2; Dimension 69"H x 43"W x 31"D; Approx. Ship. Wt. 503 Lbs. A390WP1 - Self-Close, Self-Latch Safe-T-Doors; Shelves 2; Dimension 71"H x 43"W x 31"D; Approx. Ship. Wt. 532 Lbs.